Within politics, the idea of an engagement ladder has been around for decades. You begin to engage a potential supporter through a small, low-hurdle action, such as a short, ID survey (who do you support, etc.) or nowadays an email sign-up. The idea is that you then harvest those that filter through this initial hurdle with a larger ask, such as posting a yard sign. Eventually, you grow the supporter's engagement to volunteering their time and, ultimately, giving money. Notice any parallels from this figure from Groundswell? 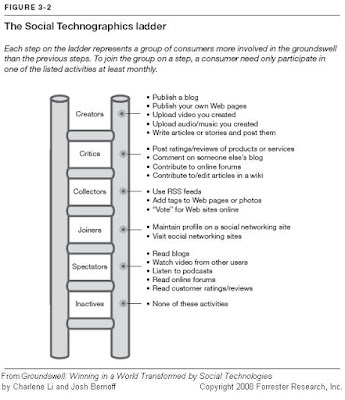 The social web allows the political engagement ladder to elongate in both directions. The gamut of actions from which you can choose to employ to grow your pool of supporters becomes vastly larger. The low-hurdle asks no longer have to be as active as a phone survey or even an email sign-up - now you can ask them to download a virtual gift within a social network (see Hillary Gifts). Once engaged, the actions available can be much more broad than in the offline world. Campaigns are already allowing supporters to make phone calls from home. May more opportunities exist to activate and engage the supporter through social media (well beyond my ideas or existing examples). How can the ladder be expanded? Some ideas I have include: Update widgets, squidoo.com lenses for narrow topics, netvibes.com universe for public desktop, BlogCatalog.com for topic networking, phone/mobile SMS action alerts- I use twimbler.com to send action alerts to mobile users, cell phone-friendly webpage, comments networking. My activist blog All Things Reform has some of these, plus a list of the blog's usage analytics tools. Thanks for an interesting and always expanding topic for these days of increased social networking!